There are only two herbicide active ingredients labeled for pasture systems in Florida which are active on smutgrass species: glyphosate and hexazinone (e.g. Velpar, Velossa, Hexar). Since applying hexazinone at the recommended rates can be cost-prohibitive for many ranchers, and lack of control that often occurs when rainfall is limited (< 0.25 in.) or excessive (≥ 2.5-3.0 in.) after application, the use of rope-wick and roller applications could be an additional method of smutgrass management. A preliminary experiment was conducted in 2015 on smutgrass using a 10% v/v glyphosate solution and wiping in two directions. Results were very promising within the year of application, but by the summer of 2016 almost every smutgrass clump had recovered, indicating that the glyphosate concentration was not high enough to control the entire plant. We initiated a study in 2017 at two separate established bahiagrass pastures in Hardee and Highlands counties. 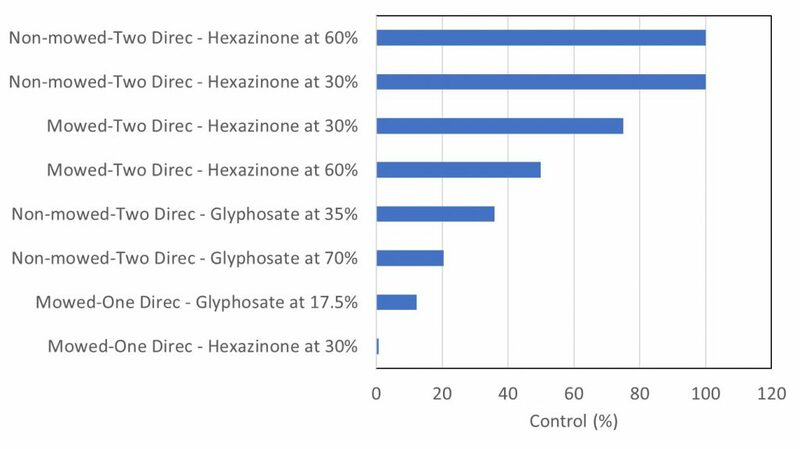 Our main objectives were 1) to determine the activity of different glyphosate and hexazinone concentrations using the weed-wiper; and 2) to determine the effects of mowing on the activity of glyphosate with the weed-wiper. We evaluated two mowing treatments (mowed and un-mowed) and six herbicide treatments (glyphosate at 17.5, 35 and 70% v/v; hexazinone at 15, 30, and 60% v/v) applied in one or two directions. Approximately 30 days prior to applying glyphosate with the wiper, half of the treated area was mowed to a 4-inch stubble height. Herbicides mixed at the proper concentration and applied in either one direction or two directions (opposite) by adjusting the wiper so that it was at least 2-inches above the bahiagrass canopy. Smutgrass control was determined by comparing pre-treatment plant density with post-treatment plant density in the center of each plot at 365 days after treatment. Figure 1. Smutgrass control at Hardee County one year after using the weed wiper application technique. Concentration is provided in % v/v. Note: Only treatments providing a positive level of smutgrass control are shown. Complete control of smutgrass was achieved at the Hardee County location using hexazinone at 30 and 60% when wiped onto non-mowed smutgrass in two directions (Figure 1). However, wiping these concentrations onto mowed smutgrass resulted in less than 80% control. Glyphosate performed poorly at this location and did not provide more than 40% control. Complete control of smutgrass was not achieved at the Highlands County location. Glyphosate at 35% v/v wiped in two directions onto mowed smutgrass provided the highest level of control, but it did not exceed 75% (Figure 2). Conversely, this same concentration applied in only one direction resulted in only 31% control. 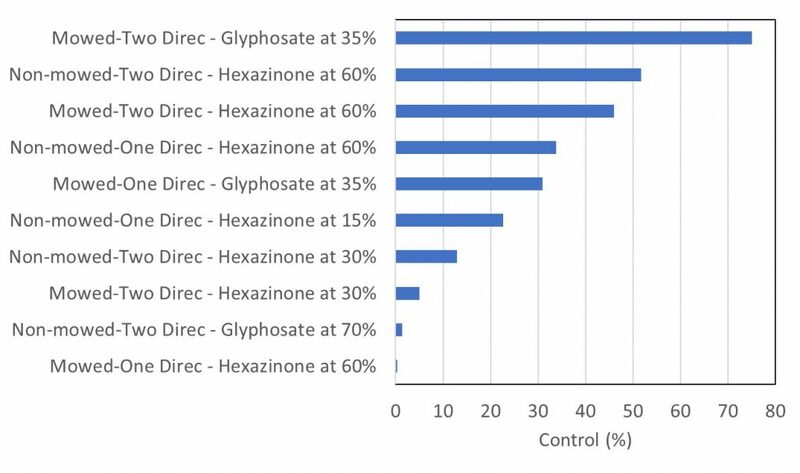 Hexazinone (60% v/v) applied in two directions onto mowed or non-mowed smutgrass resulted in 45-53% control, but this concentration applied onto non-mowed smutgrass in one direction resulted in 34% control. Figure 2. Smutgrass control at Highlands County one year after using the weed wiper application technique. Concentration is provided in % v/v. Note: Only treatments providing a positive level of smutgrass control are shown. The lack of activity of glyphosate at these rates is surprising, considering we were observing good activity during the year of application at all rates of glyphosate. The level of hexazinone activity we have observed is also surprising. Since hexazinone provided the best control at the Hardee County location and the second best control at the Highlands County location when wiped in two directions, perhaps hexazinone is the better tool for wiping smutgrass during the rainy season. This is because we know that the best activity from hexazinone occurs following rainfall to incorporate the herbicide into the root zone. Without rainfall and active smutgrass growth, control of smutgrass will likely be minimal. Control of smutgrass using glyphosate in the wiper may be best accomplished during the late spring prior to the rainy season. During this time period, smutgrass is growing a bit faster than bahiagrass and the bahiagrass tends to be shorter and over-grazed. This provides a much greater height differential between smutgrass and bahiagrass allowing the wiper to be lowered and cover more of the smutgrass plant with herbicide. Our experiments were conducted in July, and having significant height differential between smutgrass and bahiagrass was difficult. This may be one of several reasons why there were so many differences between our two experimental sites. Overall, the use of a weed-wiper appears to be fairly easy. However, there are definitely challenges when using this technology and we often refer to this method of weed management as an “art” rather than a science. We have found that it takes significant practice and patience when using the weed wiper. This ensures that you have sufficient herbicide solution on the wiper as well as enough growth of the target weed to ensure proper herbicide interception while limiting the interception of non-target, desirable plants. Furthermore, some plants grow faster than others, and not all plants will be controlled within the same year. Therefore, it will likely take multiple years of wiper applications for satisfactory control. In closing, be sure to follow the herbicide labels as there are restrictions when using glyphosate with the weed wiper. For example, the Roundup PowerMax II™ label indicates that livestock should be removed prior to application, with a 3-day grazing restriction, and that it should not be applied to more than 10% of the total field area at any one time. Learn more about this topic at the upcoming UF/IFAS Range Cattle REC Field Day – Smutgrass Management Using the Weed Wiper and Haylage Management. This free event will be held at the Center on June 27. Click here to view a flyer with details and registration link. ← Will Hexazinone Work for Brunswickgrass Management?